If you are not making mistakes, you aren’t doing anything! If you do not make mistakes, you are not trying hard enough! If you’re not making mistakes, then you’re not doing anything. I’m positive that a doer makes mistakes. (John Wooden) I saw an interview of Sara Blakely, founder of Spanx (a multi-million dollar undergarment company). She said her Dad asked her every day what mistakes she made. He celebrated her mistakes! What if we celebrated our mistakes and did nothing when we succeeded? Have you ever thought about celebrating your mistakes? Apparently, Sara Blakely’s father did! I can see the wisdom in celebrating mistakes because it encourages trying. You know making an effort no matter the results. I often see some of my students stop trying. So it is very important to keep trying, particularly when you fail. Failing is only failure when you are satisfied with the results. It reminds me of football games in high school. If you gave up, you were out of the game. The coach had no tolerance for players who did not try. Sports and games can teach us lessons for life. When you stop trying, you gave up. What does that say about you? Are you satisfied with the results? Did you make your best effort and fail? There is no shame in that! Usually, it is not true. You can always reassess and change your efforts. I think it is the heart of making mistakes to try new things and not worry about making mistakes. Have you tried something new today? 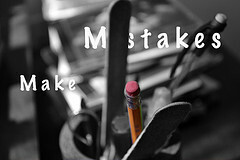 If you are not making mistakes, you are not growing personally or professionally. Remember, I am not talking about making big financial, personal or professional mistakes! I am suggesting stepping out of your comfort zone and trying new things. It may be looking at things differently or trying or just taking calculated risks. I know some of you take investing risks! Are all your investments guaranteed winners? I reserve a portion of my portfolio for calculated risks. I invest in up and coming stocks on occasion versus the blue chips, dividend or triple A stocks. The payoff can be big or not. They are calculated risks using a modest amount of money. Years ago, I invested in a biotech that eventually became a powerhouse. There have been others with varying results. All the winners won big and the losers were small losses. Was it worth it? Absolutely! Remember, mistakes are an error in judgment! How do you improve your judgment? It is simple; you have to make more decisions. One of the things I did with my children was giving them lots of opportunities to make decisions. It started early by giving them choices. It may have been a choice of toys, clothes to wear that day or what story to read them. At three or four years old, you have to start small. Sometimes choices had consequences too. Making mistakes is part of learning how to make better decisions. It is a good reason to celebrate mistakes because you will learn from your mistakes. It is the start of making better decisions! Starting with small decisions in a controlled environment is a good way to practice making decisions. The more decisions you make, you naturally will improve your judgment. Making mistakes should be celebrated because you are trying to do things. You cannot make mistakes unless you are doing something. It reminds me of the movie, Rudy. It is about a young man who was too small to play Notre Dame Football, but he was determined to overcome the odds. He made mistakes, but stuck with it and eventually played in a Notre Dame game. It really is a tribute to the impossible and this young man was able to accomplish it by just trying. What mistakes did you make today? I just finished reading the Confidence Code and they say much the same thing – act, do, decide and fail fast. They talk about how in technology you make lots of prototypes – pick the ones that works, throw out the rest (fails) and move on. One of my pet peeves is software is published and sold when it is just a work in progress. For the next year or so, there are updates etc. Most mistakes are fine so long as you learn from them. If you’re making the same mistake over and over, that means that the learning portion is not holding, which could lead to serious consequences. I agree! I think this is also the definition of insanity, doing the same thing over and over again and expecting different results!